How to Write Rap Lyrics Professionally? Most people consider rap as perhaps the easiest music to attempt, because you only need a voice and a beat, but this simplicity can be deceptive, because knowing how to write rap and lyrics and songs is hugely difficult, perhaps more so than other complex forms of music, because you have to find a way to make all the base elements fit together effectively. There’s far more focus on the vocal performance and the lyrics than in other types of music, so knowing how to write your own rap is largely about knowing how to take advantage of the tools you have and meld them together into an effective song. Writing rap lyrics is one of the greatest musical challenges, mostly for the simple reason that when it comes to rap there’s nothing to distract from the performer, it’s just the person and the lyrics, so if you want to be successful you’ll work o come up with some great lyrics. The problem of music creation is this is far from easy, it takes an extensive amount of time and effort to write rap lyrics, and even then there’s no guarantee that they’ll be of decent quality. Listen to music ghost writers rapping to you. Rapping is something that requires less instruments and technology than pretty much any other kind of music, just a persona and a beat, and for this reason, many people think they can do it and that it’s easier than other types of music, but the reality couldn’t be further from the truth. What makes rap writing so difficult is that there’s nothing to distract and take away from the vocals, the vocals are pretty much all the music itself, and therefore they have to be as good as possible, both in terms of lyrical content but also in terms of structure and flow. Many people attempt rapping but few actually find success, and this is because of the unique combination of skill and diligence required to know how to write a rap lyrics. Our service is here to take some of that responsibility off your hands and make your journey to rap success a little simpler by providing high-quality lyrics of any kind that you need. A large part of writing rap lyrics is simple instinct and simple rhyming, you have something you want to say, you come up with a line, and then build the next off that with clever rhymes. It’s a tough task, and the one that most aspiring rappers struggle with, but here are a few tips and recommendations. Have a clear idea of what the purpose of the song is, what you’re trying to accomplish and ultimately what you’re trying to say, and then make sure that every line in your lyrics works towards this goal. Go line by line, don’t feel the need to tackle it all at once, knowing how to write good rap lyrics is about taking your time and building something effectively yet methodically so you can trust it all to hold together. Tone is important, make sure the lyrics match not just the tone of the song, but of your voice as well. If you already have the beats then build your lyrics line by line around the tone and feel of it, if you have the verses but not the chorus make it so it all weaves together. There is no type of lyric writing more difficult to tackle than rapping, if only because in a rap song the lyrics and the voice are essentially the fundamental basis of the song, whereas other types of music are listened to for catchy tunes, guitar and drum solos, rap is one long vocal solo with all the attention on you, so it’s no surprise that writing rap songs and lyrics is such a struggle for most people. Writing lyrics is something you can’t truly know how difficult it can be until you’ve tried it. Think of writing an essay in school, except now forcing yourself to condense it into a few lines and put it within the rigid structure of a rap song, and also make it rhyme. This is the challenge that rap writing present, and it’s no surprise that so many people struggle with it and look for help writing a rap song. There are many things which go into being a good rapper, flow, voice, style, the lyrics are just one aspect. This is why rap ghostwriting is becoming a prevalent thing to those who are good at flowing and have a good voice but don’t specialize in writing lyrics, or to those who don’t have the extensive time necessary to conduct high-quality rap songwriting. Rap ghostwriting can be hugely helpful and make your life much easier, but it’s all about the ghostwriter that you go with, how capable they are and what they can do for you. Get a better grasp of how our ghostwriting services work right now! One thing about writing rap music is that the production and the vocals are two completely separate entities which must fit in with one another, and if you have one then writing the other becomes exponentially easier, and this is especially true of rap ghostwriting. If you have a beat or a tune in mind then the lyrics become much easier because you have a structure to build around, as well as a tone to work with so you can develop your song with consistency, and rap ghostwriting works the best like this. The lyrics are the heart of your rap songs, so if you want your songs to be the best they can and if you want to have your best chance at finding success in the rap game then your lyrics will be the main focus, and writing rap lyrics is very difficult! However, it’s really as simple as sending in the details of what you want and look for to our professional music ghostwriting service, and our ghostwriters can get to work immediately. Many people try to write a rap song but find that the lyrics are simply too difficult to master, and this is where the help writing a rap song can come in handy. Writing rap is an acquired skill, it’s quite different than any other kind of music and rap lyrics are considerably more difficult to write, simply considering the increased volume and focus on the vocals when it comes to rap. This makes good lyrics an indispensable part of being a good rapper, and our professional ghost writers for rap can help you craft lyrics that will set you apart from the competition and set you on the road to rap success. We understand how difficult writing rap lyrics can be, the rap game is a grind and if you want to be successful you have to take advantage of every opportunity you can, and that’s just what our service presents, an opportunity. Rap ghostwriter for hire can get you advanced, complex, and beautiful lyrics, or simple and meaningful ones, no matter what you need we’ve got the ghost writer rap that you need. Not everyone wants to deliver a traditional style of speech at a wedding and not everyone wants to give a toaster as a gift. So how about delivering the rap wedding songs instead? Imagine performing a wedding reception rap and the impact that it will have on the atmosphere of an already joyous occasion. But writing a rap is not always so easy, especially if you are not a skilled songwriter. This is why it will be best to turn to us for your wedding songwriting needs. Through us you get to work with a true expert in writing songs as well as provide you with wedding speech help. They will work closely with you to find what they need to develop lyrics for your specific wedding rap so that it is perfectly personalized and will have the effect that you are looking for. Being a rap writer is something that is far more difficult than most people expect or account for, many people treat rap as one of the easiest mediums to conquer because you don’t need many tools or instruments, just a person, and a beat, but this doesn’t make the skill in itself simple, in fact being a rap writer is likely the hardest type of lyric writing in all of the music. There’s little to distract the listener from your lyrics in a rap, so if you want to be successful you have to be sure that you have lyrics of the highest quality, and though accomplishing this can be a difficult task to say the least, with the help of the best rap writer online from our site getting high-quality lyrics doesn’t have to be so hard! A large part of being a good rap song writer is maintaining consistency throughout every aspect of the song, from the tone and voice to the structure and themes, and maintaining all these disparate aspects and combining them into something effective and united is a tough task, but it’s also something that our professional rap song writers specialize in! We have a team of best rap writers who have extensive knowledge and experience largely stemming from their own rap careers, we gathered only the most talented and capable writers who could craft intricate rhymes and meaningful lyrics, so no matter what kind of help you need you can trust us to provide you with a high-quality rap writer online who can get you the help you need. There are many writing services out there on the internet but few really care about what they provide for their clients. Most work by taking an order and then finding the very cheapest freelancer they can find to provide the work without any form of checks to see if they can actually deliver to the client solution of writing a rap task. This results in copied writing or very poor work often in pigeon English. 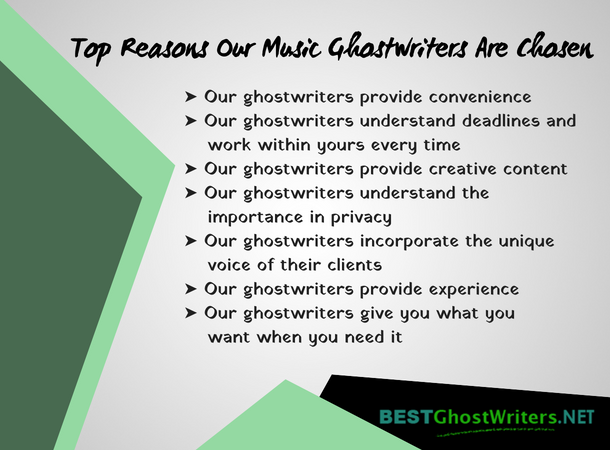 We, however, are a professional ghostwriter service and can provide you with proven writers that cover all different styles and areas of writing including music and lyrics. We will choose from our many qualified writers and select the one that best meets your specific requirements ensuring that you are working with a real expert in the area. So if you’re looking for ghost writers you’ve come to the right place, because we have a team of rap ghostwriters who have extensive experience and knowledge in writing rap lyrics, with most of our pros having experience as rappers themselves, so no matter what kind of lyrics you’re looking for you can always trust our rap ghostwriter service to provide you with a high-quality rap ghost writer! You won’t find a better place to get an advice on how to write rap lyrics, so don’t hesitate to enlist our help today and get ahead of the game! If you are looking for a great Music and Script Ghostwriters, look no further. You have found the best! Our experts know what you need and how to write it. We are dedicated to your needs and want you to succeed. When you hire our team, you have hired the best.